But I'll stop the boring rambling about Camisole dresses, and let's move to the more exciting part! The set itself looks quite huge, but actually it's just a very unlimited variety of texture edits used on the mesh itself. So basically, there are only 6 meshes, but over 12 different variations! 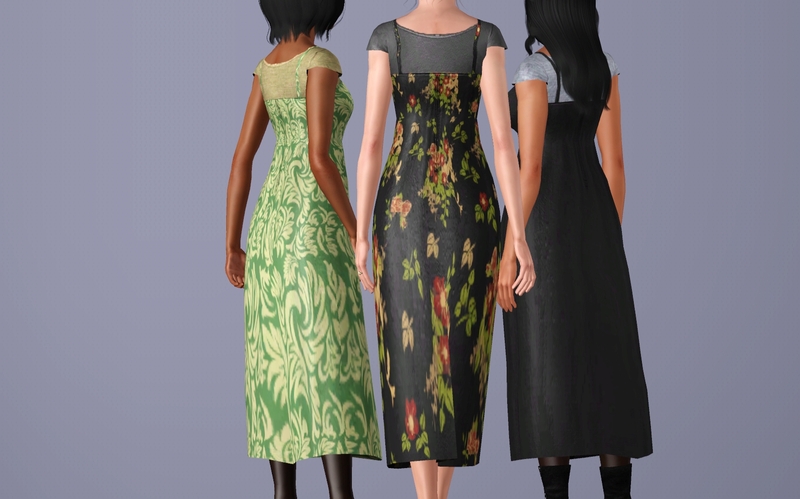 And the meshes itself are just differences in length of the skirt itself So plenty to choose from! I also uploaded those files separately, so say you only want to no lace and no shirt version, you can easily get those! Or, if you feel like it, get the all version which is basically an 'all-in-one' package! By default, they also come with 3 different presets, as shown in the images! The textures are all hand-drawn, except for the lace... I used Bonehilda's maid outfit as a reference for that! While the mesh looks quite simple, I also meshed it myself, both the shirt and non-shirt version! EA for the lace texture!